Location Ellerton Moor. Juniper Gill. Footpath at top edge of west bank. Geology Namurian strata above the Main Limestone: Richmond Cherts and Crow Limestone. Record Name Ellerton Moor. Juniper Gill West Side. Fine multi purpose scraper/burin of Neolithic or Earlier Bronze Age character. Stray find. Record Description Large scraper/burin/spoke shave multi purpose compound tool of unpatinated grey/black flint. Stray find. This very interesting artefact was located on a narrow sheep track in thick heather at the top of the western edge of Juniper Gill during one of a series of SWAAG Archaeological field walks across the the Army Ranges on the southern edge of Lower Swaledale. 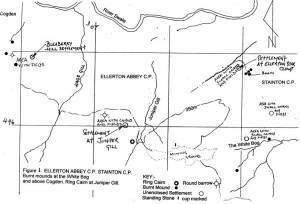 It may not be fortuitous that this fine object was located less than 100m to the north of a large but inconspicuous ring work interpreted as a ring cairn (or enclosed cremation cemetery) of earlier bronze age character located at the top of Juniper Gill, see plan. 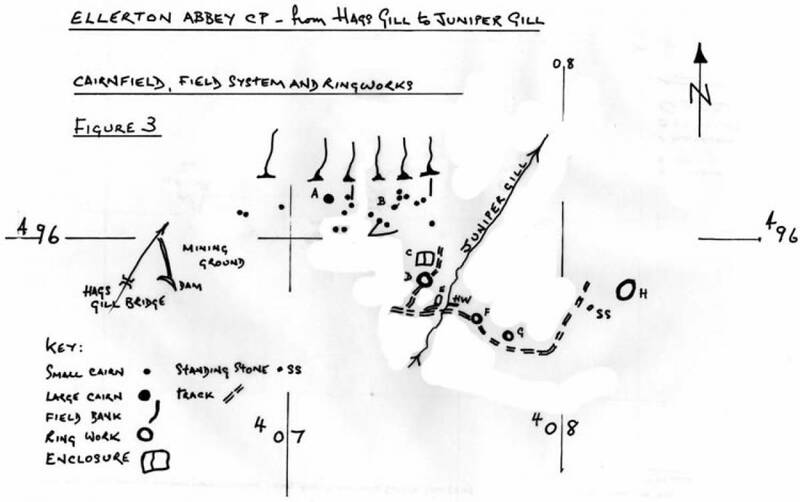 An alternative interpretation for this isolated ring work could be as an unenclosed round house associated with the cairnfield settlement complex located on the summit of the high moorland spur to the west of Juniper Gill, see attached location plan. 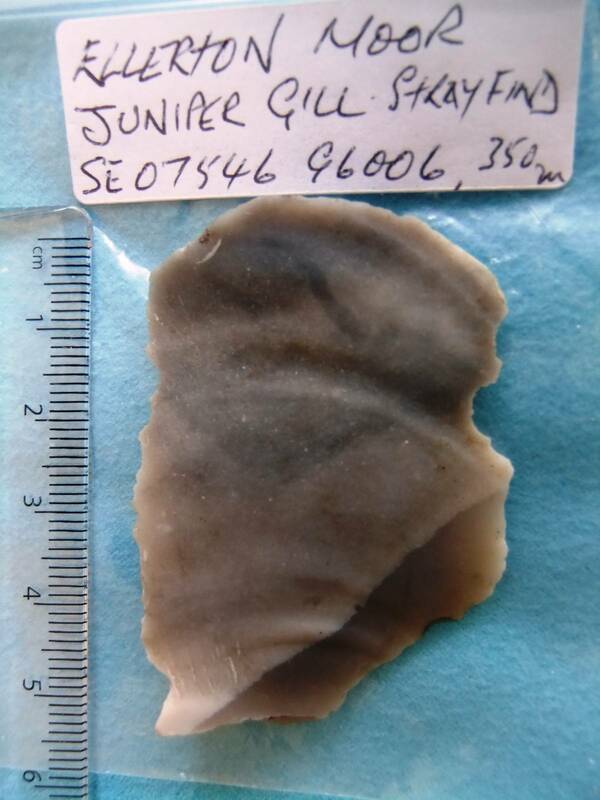 The character of this large scraper/burin and black translucent flint material is identical to the collection of similar artefacts located above Calvert Houses further west in Upper Swaledale and on display at the Swaldale Museum at Reeth. Additional Notes This artefact is in pristine condition, having been buried under thin peat and just recently been exposed by animal traffic on a narrow sheep track. 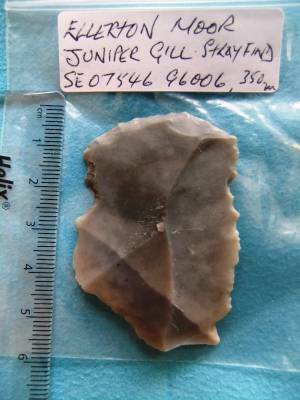 No other artefacts were located at this vicinity although two artefacts of comparable or earlier age, one a chert scraper, the other a chert core with blade scar removals were found during the previous walk on Ellerton Moor. See later SWAAG Record. Image 1 Description The Juniper Gill scraper/burin. Dorsal view. Image 2 Description The Juniper Gill scraper/burin. Ventral view. Image 3 Description Location Plan. 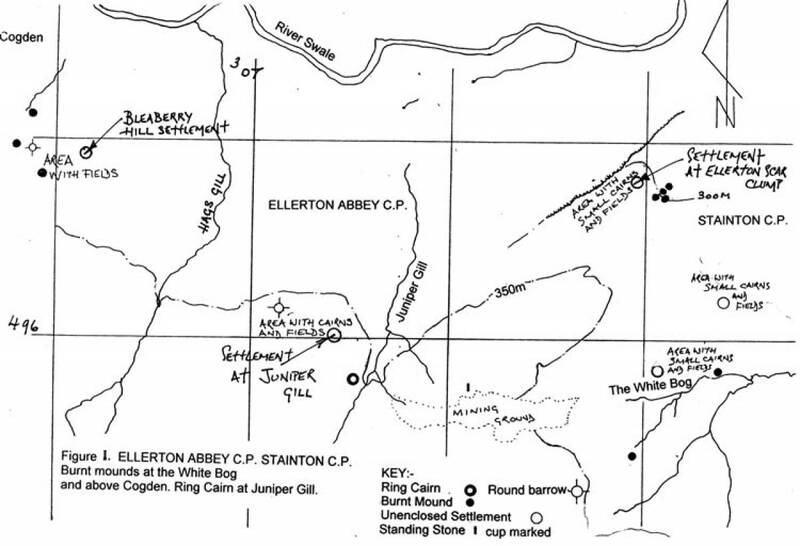 Archaeological sites eastward from Hags Gill to the Ship Plantation above Ellerton Scar. 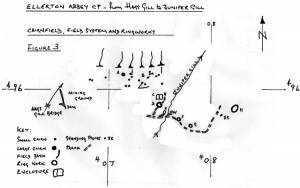 Image 4 Description Bronze age cairnfield settlement complex and other sites at 350m AOD west of Juniper Gill.Location of sites. TCL walkover GPS survey. Army Ranges, access only by written permission.